The intervention in Libya, the refusal to intervene in Syria and the denunciations of the interventions in Mali and Central Africa show that the use of force is up for discussion again. Traditional theoretical approaches to conflicts are inoperative. This article describes how the Belgian, French and German greens reacted to this problem. Since the September 11th attacks, the philosophy of war and the terms and conditions according to which force can be used have been the subject of intense debate. Conflicts, that appear now less and less frequently between states, present many new characteristics, meaning that traditional theoretical approaches to conflicts are inoperative. Among other factors, the privatisation of violence, tensions between communities, serious infringements of human rights and the deconstruction of states are redefining the nature of these new conflicts. Grey areas are becoming the norm in territories where political borders no longer have much meaning. In the face of this international turmoil, new reading lists have appeared which aim to explain as best they can the links they believe will govern the world from now on. However, many simple explanations result in simplistic arguments in which the complexity of the situation is denied and a new Manichean approach is preferred. Beyond that, sometimes rightly, critics also have much to say about a “West” which, they allege, is selectively compassionate: there are, they say, some causes the West supports (Libya), others it ignores (Israel-Palestine, Yemen, Syria) and lastly some – the “worst” – which it conceals behind active neutrality for geostrategic reasons (for example Bahrain). The refusal to intervene in Syria and the denunciations of the interventions in Mali and Central Africa show that the use of force is up for discussion again. In that context, the green parties seem to be torn between two virtually irreconcilable attitudes. Claiming a pacifist history, many ecologists have stressed the dangers of military interventions and how few positive results they produce. This pacifist tendency is demonstrated in an idea which is both simple and strong: “make war on war”! Conversely, the views of another tendency stress the defence of human rights and threatened populations, highlighting the responsibility to protect them from the risks of genocide or massacres on an immense scale. Each side presents the basis of its moral and pacifist arguments and the need to defend human rights but they have been tearing themselves apart since the military intervention in Libya in 2011, leaving a deep and painful wound. Before investigating the new frames of reference which may define green parties’ proposals concerning conflicts and the use of force, we should review the positions taken over the last 30 years. During that time, green parties have swung between anti-militarism, pacifism, non-violence and peace through law. Initially, during the 1980s, it was through the fight against nuclear weapons that green parties first stepped into the international arena. That concept, which helped unify the movement for the German Greens, later manifested itself in their opposition to not only nuclear weapons, but also the ‘civilian’ uses of nuclear power. Followed by the French and Belgian Greens, that position was apparent in their participation in the many anti-Euromissile demonstrations which shook Western Europe in the early 1980s. Opposition to nuclear weapons is not the only mainstay. Antimilitarism is also a green concern. After 1983, French-speaking Belgian ecologists called for the simultaneous dissolution of NATO and the Warsaw Pact. For their part, the French Greens have been involved in actions such as opposing the expansion of the military training camp at Le Larzac in South Western France, while the German Greens have invested their efforts in opposing armed combat, of which they would have been the first victims in any conflict between the USA and the USSR. Grey areas are becoming the norm in territories where political borders no longer have much meaning. Ecology and pacifism thus seem to have been associated with the Greens during the 1980s. According to some Greens, such as José Bové, the commitment to antimilitarism is supposed to be a preliminary stage before the adoption of the green agenda is pursued further. However, in recent years Belgian and German ecologists have had little to contribute to these international discussions: in their opinion, the question of military intervention barely arises because neither country intervened outside European borders throughout the 1980s. The accession to power of Mikhail Gorbachev and the global disarmament agreements, followed by the collapse of the Soviet Bloc, ultimately changed the way ecologists perceived armed conflict, as well as the perspective in which the green movements decided to join the critics of neo-liberal globalisation and the economic development of north-south links. Support for the promotion of human rights and respect for international law began to gain the upper hand. However, tension developed between the supporters of anti-imperialist pacifism, opposed to NATO’s operations in general and those of the United States in particular, and a tendency to intervene in humanitarian action framed by respect for international law and the resolutions of the United Nations. Various events crystallised those diverse attitudes. Gradually, the French Greens started supporting military interventions, of which Kosovo is an emblematic example. Going further than their Belgian counterparts, French ecologists called for the continuation of the bombardments and the “installation of an international police force charged with intervening on the ground to re-establish peace and the territorial integrity of Kosovo”. Their adoption of such a bold stance was justified by the rejection of cowardice in the face of the violence exerted against civilians. For Ecolo, the green party of francophone Belgium, the change of attitude was more decisive, and very sudden. In September 1998, the party still declared itself against any military intervention in Kosovo, while demanding “Belgrade must call an immediate ceasefire, withdraw its special forces from the province and arrange the safe return of the refugees” and embarked on a process of peaceful dialogue with the Albanian population of Kosovo. The party denounced the hold of NATO and the United States over the settlement of the conflicts, emphasising the necessity of accelerating the introduction of a true European policy of security and defence within the institutions of the European Union. The 11th September attacks, however, radically changed those attitudes. Although opposition to the war in Iraq was unanimous, Ecolo in particular considered it a “useless, absurd, dangerous, unjustified”, attitude to the use of force. Once again focusing on the defence of international law, the situation was interpreted in various ways and the idea of the “just war” was pushed into the centre of attention. It was this time when French greens confirmed their change from “militant antimilitarism” to realism in international relations. As Denis Baupin emphasised in 2011, “When the population really is in danger, we support intervention”. Gradually, the French Greens started supporting military interventions, of which Kosovo is an emblematic example. The German Greens were also affected by that change. Thus, on the initiative of Joschka Fischer, then Foreign Minister of Germany, the green party acknowledged that, in the last resort, the defence of human rights could involve the use of force. “Force must not replace policy, but we also know that the use of violence legitimated by the law of the State and international law cannot always be ruled out” – he said. It was those ideological positions which led the Greens to declare themselves in favour of the intervention in Libya in 2011. Faced by the threat of mass crimes against the Libyan population, the Greens supported the use of force. Yves Cochet, a green member of parliament for Paris, summarised the position as follows: “Yes, we do approve it. We may be divided – people don’t like war – but we must intervene in this case. It’s a sort of right to intervene”. Not much later, however, events snowballed. The military operation ended with the fall of the Gaddafi regime, and many observers believed that the intervention exceeded the mandate issued by the United Nations, ultimately causing a severe international trauma. The anxiety of the BRICS countries (Brazil, Russia, India, China, South Africa) quickly turned to resentment of the Western nations which they accused of not only exceeding the UN mandate, but also of using their “responsibility to protect” in order to intervene in the internal affairs of countries they wished to control. That resentment was shared by many pacifist associations in the West which denounced the naïveté, or even the lies, of the political parties which had supported the use of force, including the greens. The drama in Syria, the destabilising events in Central Africa and Mali but also the conflicts in Israel/Palestine, Ukraine and ISIS will continue to accentuate their anxiety about the settlement of conflicts, or even simply about their comprehension. Traditional formulas continue to be proposed, despite the fact that the world is changing, and with it its points of reference. The ultimate goals, always shared by the ecologist parties, are still world peace and global disarmament. The denial of the complexity of military interventions, shared by many movements, does not exonerate the green parties from a gap in their understanding of the international system. The route markers enabling them to reach that understanding are absent or even disregarded, and Greens often still believe that power resides in the nation-states. Now, the wars which followed 11th September 2001 call into question the notion of the theory of the “just war” and its criteria. New elements also revived the question of ethical considerations regarding the states’ commitments: migratory and financial flows, environmental risks, increased inequalities, and many other issues, raising the stakes linked to the causes, terms and conditions of the conflicts, and hence influencing how to respond to them. To many observers, it was no longer a question of adopting a “least bad” policy but rather a “non-nuisance” approach and the conditions governing the use of force are part of that. 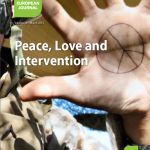 The reassessment of the conflicts, their resolution and the terms and conditions governing intervention therefore present a new challenge for the ecologist parties, because new threats are looming: for example, privatisation, computerisation and the causes and environmental consequences of wars. The fight against impunity must once again become an objective to defend. The promotion of international justice making each state, group or person responsible for their acts is a fundamental stage in the process at local and global level, as is tackling the warmongers of tomorrow. Moreover, the question of the public reappropriation of armies and conflicts must become the skeleton of new pacifist movements which will need to judge both their allies and their enemies objectively, because the ultimate goals, always shared by the ecologist parties, are still world peace and global disarmament. Future debates will therefore have to concern recovering the balance between violence and the law and the law’s capacity to frame violence. Only if that aim is achieved will it be possible simultaneously to avoid international anarchy and the splendid isolation of nations and/or opinions which prefer comfortable blinkers to difficult undertakings. To do that, the green parties in Europe will have to make their views about those new challenges heard and, above all, they will need to listen to and understand one another.